Join us on our specially permitted walks to learn about these endangered reptiles & experience a female Loggerhead Sea Turtle lay eggs. 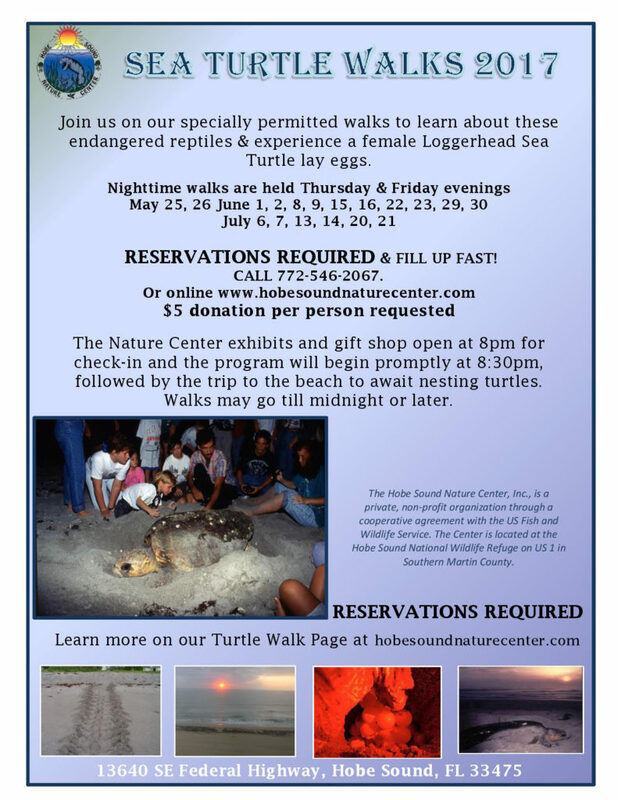 The Hobe Sound Nature Center will once again be conducting nighttime sea turtle walks on a local beach to educate the public about these endangered reptiles. These walks are specially permitted by the Florida Fish & Wildlife Conservation Commission and the United States Fish and Wildlife Service. They follow strict guidelines established to avoid disturbing or harassing nesting turtles. Nature Center at (772) 546-2067 or through www.hobesoundnaturecenter.com. Numbers are limited to 30 persons on each walk and a donation of $5.00 per person is requested and gratefully accepted. The Nature Center exhibits and gift shop open at 8pm for check-in and the program will begin promptly at 8:30pm, followed by the trip to the beach to await nesting turtles. Walks may go till midnight or later.